HP 410A Toner Cartridge Cyan, Yellow & Magenta, 3 Toner Cartridges (CF411A, CF412A, CF413A). HP 410A (CF251AM) toner cartridges work with: HP Color LaserJet Pro M452dn, M452dw, M452nw, MFP M477fdn, MFP M477fdw, MFP M477fnw. Save 10% with HP toner multipacks. HP 410A (CF251AM) Cartridge yield (approx.) per cartridge: 2,300 pages cyan, 2,300 pages magenta, 2,300 pages yellow. Original HP toner cartridges are specially designed to work with your printer to consistently deliver standout results throughout the life of your cartridge. Ensure that your printing is right the first time and every time with HP printer toner: 410A toner. 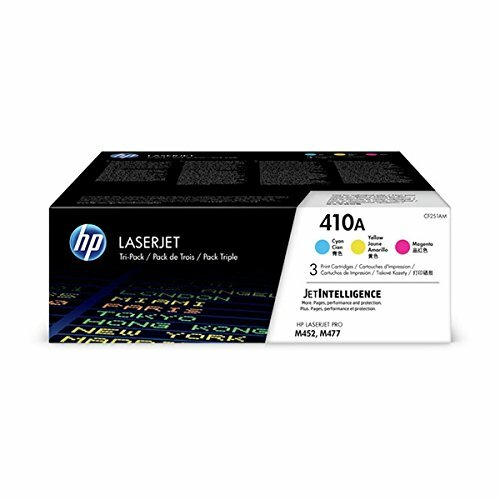 What's in the Box: New Original HP 410A pack of 3 toner cartridges (CF253XM): 1 Cyan (CF411A), 1 Yellow (CF412A) & 1 Magenta (CF413A) toner cartridge Colors: Cyan, Magenta, Yellow. HP 410A (CF251AM) toner cartridges work with: HP Color LaserJet Pro M452dn, M452dw, M452nw, MFP M477fdn, MFP M477fdw, MFP M477fnw.